VX murder in Kuala Lumpur? 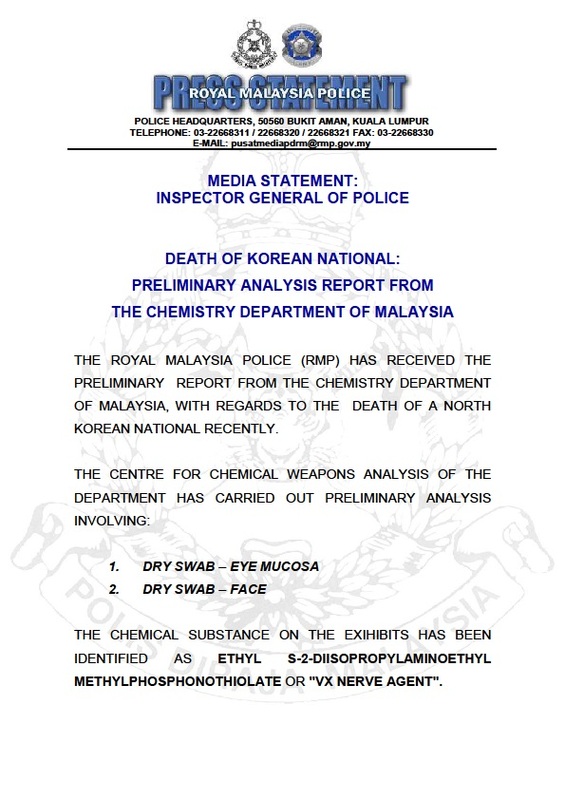 According to an overnight statement by the Malaysian police, Kim Jong Nam—half-brother of North Korean leader Kim Jong Un—was assassinated with the nerve agent VX at Kuala Lumpur International Airport. VX is one of the high-end chemical warfare agents developed and produced in large quantities by the USA, USSR and some secondary powers during the cold war. Former military chemical weapon arsenals are being eliminated under the Chemical Weapons Convention. The Democratic People’s Republic of Korea (DPRK), of course, is together with Egypt, Israel and South Sudan one of the four hold-out states. It is widely believed to have a significant chemical warfare capacity, but how militarily effective it might be is anyone’s guess. Commentators will happily inform you that it possesses the world’s largest stockpile, which is as good as meaningless given that all other arsenals have been almost entirely eliminated under international supervision. BBC World already broadcast a report in which an unidentified ‘expert’ said it had to be a nation-state because its synthesis is far too complex for your backroom. However, the substance is not unknown in terrorism: Aum Shinrikyo synthesised somewhere between 100 and 200 grammes of the substance between 1993 and 1995. It tried to assassinate several opponents by spraying it in the face of the victim with a syringe. Only one person died; the others survived. It always appeared technological overkill: had the cult used more ‘traditional’ assassination weapons, such as knives or guns, their attacks would have been far more lethal. Why were there no previous descriptions in press reports of symptoms typically associated with nerve agent exposure (spasms, foaming, discolouration, etc.)? Why did it take 9 days since the assassination on 13 February before the poison was confirmed? Why did the preliminary toxicology report (or at least the police officer) not mention physiological consequences of nerve agent exposure, such as increased acetylcholine levels (which is responsible for the spasms)? What is meant by ‘traces’? Residue? Or small amounts? VX is a pretty persistent agent that can last for days. Rubbing the agent in the face suggests an area with a rather high concentration of the agent, even if the amount was limited. Why did the assassin not display any of those symptoms? Was she wearing gloves or was the agent contained in a capsule? (And if she was wearing gloves, were they then not found? Or frangments of a capsule?) Did she receive a nerve agent pretreatment antidote? There were some reports of vomiting, but was this reaction related to nerve agent exposure? Any splash of a tiny droplet anywhere on her body would have resulted in some symptoms of varying degree. She was jailed, but nothing to such effect was reported. There was apparently no decontamination effort at the airport. So, were first responders or medical staff at the airport clinic, police officers and other persons who came to the victim’s assistance or were in his vicinity affected through secondary contamination? No reports, thus far. Have samples been sent to one of the top-level OPCW certified laboratories, such as the Verification Laboratory, Defence Medical and Environmental Research Institute, DSO National Laboratories in neighbouring Singapore (with or without involvement of the OPCW)? Why did the Malaysian authorities say earlier today that they would sweep the airport and other locations for radioactive material? And apparently not for VX traces? Thanks for the post , and for keeping us updated . One just should not forget, this is not a forensic and comprehensive report , this is a press release . It looks as if , they wanted to officially and confirm , the rumors , about the very existence of the nerve agent in the body of the victim . Yet , it doesn’t mean , that this is the death cause . Death cause is one think , and findings and symptoms prima facie , are another think ( although it may look that highly likely that it was the death cause) . Sometimes an assassin , may mislead investigator so , in order to implicate someone else , or leading them or diverting them , to another potential conclusion or path to follow. JP, thank you for your informed skepticism. The world could use more of your type. It wasn’t sarin that killed those people. It wasn’t an oganophosphate. It was likely either CO or CN. I tried, wholly unsuccessfully, to make these pharmacological points through a series of online articles and a 280 page book named “Murder in the SunMorgue.” Even today the MSM continues to promote the Sarin Myth, although by spring of 2014 Obama and Kerry had stopped accusing Assad of using sarin and of “gassing his own people.” So far as I have been able to determine, they never made that accusation again, even though they continued to demand regime change. ~ Like Ghouta, this victim shows no signs of salivation, lacrimation, urination, defecation, and gastric emesis – without any these symptoms the Dx of VX intoxication is doubtful, although with n=1, I guess anything is possible. ~ In the photo of him sprawled in the chair, his color looks pretty good. One would expect to see cyanosis if he had received a dose large enough to kill him. My immediate guess would be CN. ~ If NoKo had wanted to take out KJN, they wouldn’t have done it in such a sloppy manner, under multiple CCTVs, in one of the most public places imaginable. If they had intended to use VX, they would have sprayed a syringe-full of it into his face while he was standing at a urinal or getting out of his car in a parking garage. The whole scenario is borderline preposterous. ~ If someone had wanted to make it look like a NoKo hit-job, VX would be a good choice for faking the evidence because of its reputation as a CW. But all one needs to do is mix some VX in water to inactivate it, add the actual toxin to the harmless solution, and now you’ve got not just a deadly solution but an evidentiary diversion. It’s exactly what happened in Ghouta – the anti-Assad terrorists spritz’d aqueous solutions of harmless organophosphate breakdown products all over the place and the gormless UN team found “signatures of sarin” and concluded sarin was used. Duh. . . Thanks again for your informed skepticism and for keepin’ em straight. Thanks JP & Dennis for your excellent questions/doubts about the case! I find them very helpful. If it was a NK killing, why did they do it at a busy airport? Also, if VX was used, was there any indications of injury/effects of the poison on KJN’s face? the pictures to back up their claim. To avoid fake news, the media reporters should all read JP’s questions first. to solve the mystery. It seems Malaysia is not doing the job well. To remove the cloud of doubts, Malaysia, as a member of CWC, should call on OPCW (Organization for the Prohibition of Chemical Weapons) to assist with its investigation. JP, what do you think of this step?